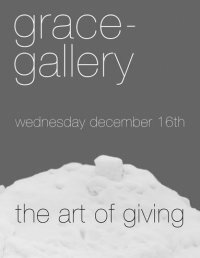 On Wednesday, December 16th, grace-gallery will be having a group show and fundraiser. I will be one of several artists exhibiting their work. This will be a cash and carry art show, supporting a local charity. This special show is a private event. Please contact me if you’d like to be on the guest list. I love telescopes. They give a perspective unlike anything else. Last night, I was privileged to visit Breckenridge Anderson Astronomical Ltd., a shop where telescopes are built. It was amazing to see what is involved in building a large custom telescope. Stacy at Breckenridge Anderson Astronomical Ltd. 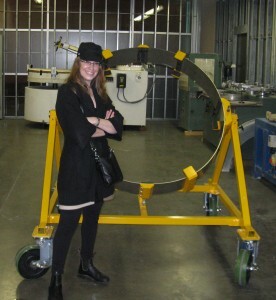 I stood beside a piece of equipment specifically designed for holding and transporting the primary mirror, for testing, and to simply move it around the shop. The mirror for this particular telescope is 50 inches across, and several inches deep, weighing 1100 pounds. The mirror was sitting in a crate nearby. When the telescope is completed, it will stand 18 feet tall. This telescope will be situated in the southern hemisphere. It will peer into space, bringing us amazing imagery, and knowledge. For me, telescopes also give me my subject matter for painting. They bring me views of outer space – views of our universe. The upcoming December 5th issue of Eclectica Magazine will be featuring select paintings from my Spaced Out series! Eclectica Magazine covers long and short fiction, poetry, travel, and more. It also features art and photography in every issue. Please see Eclectica Magazine for more information, and the store locations where it is available. Single issues and subscriptions are also available to order online. In early 2010, Eclectica Magazine will have one of the Spaced Out paintings on it’s cover, and my recent work featured inside. Please be sure to check it out!